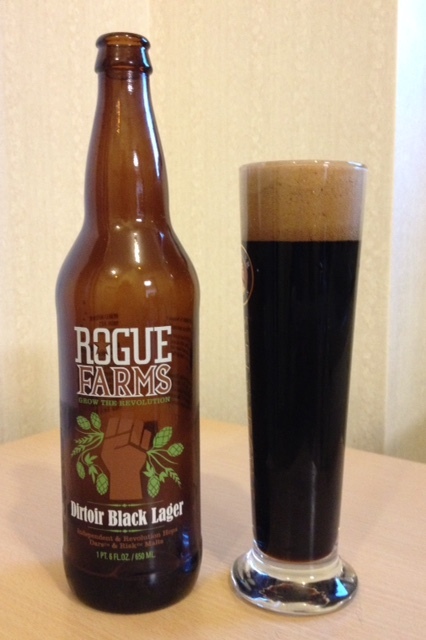 While the style of thi s week’s beer arguably originated some 3,000 years ago during the Iron Age in northern Bavaria, Germany, Rogue Farms Dirtoir Black Lager is a variation on a variation, making it a very modern interpretation of a classic German schwarzbier (“black beer”). Rogue’s history started in 1988 with a brewery and 60-seat pub in Ashland, Oregon. The brewery quickly developed a need for more space and set up their new headquarters and second brewpub in Newport the following year. They now have brewpubs in Washington and California as well, and ship their products throughout the U.S. as well as internationally. Rogue’s brewers use proprietary malting barley and hops grown in Oregon on fertile volcanic loess and alluvial soil, respectively. Dirtoir Black Lager is brewed using German yeast. For a schwarzbier, Dirtoir Black Lager is unusually bitter and full-bodied. As for bitterness, it has 43 IBUs, well beyond the typical range of 22-32. And its original and final gravity are both very high, resulting in a relatively higher density and consequently a fuller body. Its alcohol by volume is 5.4%. Schwarzbier may be described as a black pilsner or even the stout of lagers. Its dark hue comes from roasted barley; but unlike a stout, the barley is malted. Malting is simply the process barley undergoes in order to induce the production of fermentable sugars. Also unlike a stout, schwarzbier is a lager, not an ale, giving it a clean taste without such flavors as fruitiness from the esters produced by yeast. Schwarzbier is also similar to dunkel, another dark German lager, but it is usually darker with more of a roasted edge. A good schwarzbier however should not taste burnt or acrid. A schwarzbier should pour a clear, dark brown or black body with reddish highlights and a large, tan-colored head with good retention. The low to moderate malt in the aroma may be somewhat sweet and roasted. It may resemble coffee, but it should not smell burnt. The flavor usually parallels the aroma, though the malt sweetness may be more apparent. It should also have moderate bitterness and low to moderate hop flavor. Hop bitterness may linger along with dryness from the roasted malt. Dirtoir Black Lager pours a pitch black body—no highlights are visible against the light—and a dense, deep tan head which leaves lacing all over the glass. The aroma is a little smoky and savory. Rich, yeasty bread crust comes through, along with brown sugar and coffee. In the flavor, there is considerable bite from the roasting, like burnt coffee. It’s bitter and woody but rich and flavorful. The earthy, herbal hops are considerable but still overshadowed by the malt. The body is on the full side, and the carbonation is restrained but crisp. The hops and roasted malt leave a little bite in the finish. A rich, bread-like aftertaste also lingers. Overall rich, flavorful, and clean—loads of roasted malt and hops. The fairly full texture helps to smooth out the otherwise sharp bite of the roasted malt and hop acidity, though the roastiness is still a bit much. The aroma is wonderfully appetizing. Very tasty and bold on the whole. This entry was posted in American Beer, Mad Capper Reviews and tagged Black Lager, Rogue Farms, Schwarzbier. Bookmark the permalink.